So there I was at work early Sunday morning. I run Markets and Antique Fairs etc. I started at 5am and by 6.30 someone was shouting at me, Shaun, Have you got an emergency number for the RSPB? Of course I didn't, so I asked. What's happened now? So I drop everything and run over to where there was a small crowd. 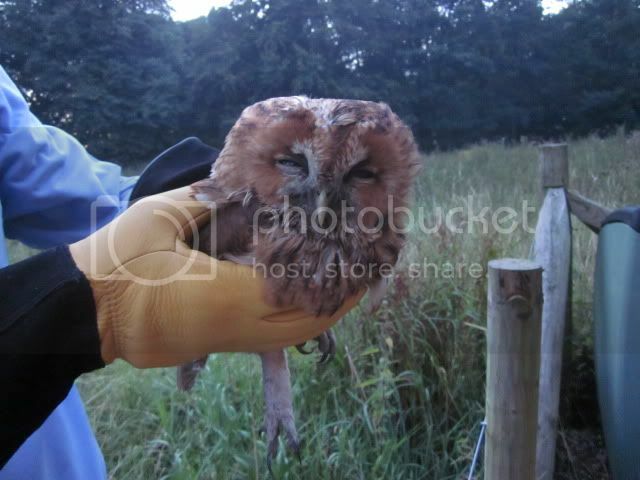 On top of a Transit van, stuck between the van roof and the roof rack, was, sure enough a Tawny Owl! Looking very sad for itself! The driver had seen something fly past the windscreen, but had no idea what it was and where it had gone! It had gone up the screen and under the roofrack. It was dark afterall. The poor thing looked like it was dead. I never thought to take a picture, I quickly slid the owl sideways, as that was the only way it was going to come out of there. It moved! So I put it in a cardboard box and it settled down in the dark for a while. The van had travelled 30 miles and the owl had probably travelled 20 of those! I didn't know if it was injured so I couldn't release it. 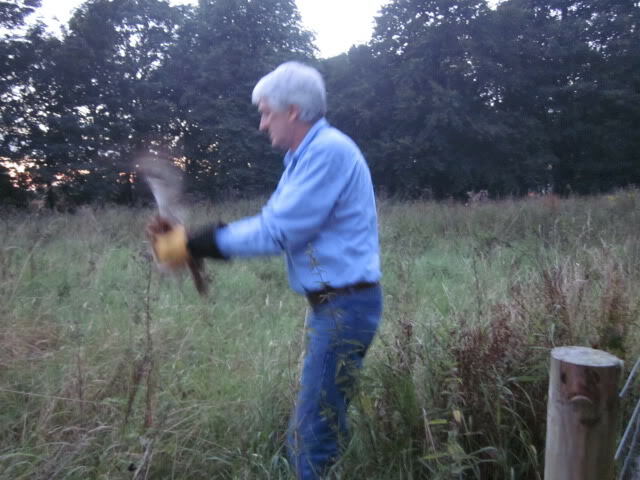 Couple of hours later, I set off for a Barn Owl specialist, to have the poor thing checked over, to see what should happen. Anyway, it checked out OK! Nothing broken! So a couple of pics. Still acting dead! Check out the claws! Of it goes! Flew like a goodun! That's a great story, thank you for sharing. It's a brilliant feeling when you rescue something and then you get to set it free all mended. I would love one day to set up a rescue for owls alongside hedgehogs. Owls fascinate me, I think they are brilliant birds. I think all wildlife needs a helping hand in this area as there is nothing to help them when they become sick or injured, and it is so badly needed. I'm afraid your little hog is not responding to treatment as yet. I am trying running a nebuliser into the incubator to see if that helps with her breathing and also she is still on drip fluids as she is not eating. I have to be honest and say the prognosis is not good really, but I'm doing all I can. Will keep you informed on her progress Shaun. Thanks for letting me know Janice! Thats a shame. I have been round the neighbours and explained about Slug pellets, though I fear that it has been affected by something much stronger than a few slug pellets! I will keep my eyes and ears open for other sufferers. To follow is a quick summary of another 'Rescue' that I was involved with last year. Sunday afternoon and I get a phone call from a neighbour that lives 1/4 mile away. Diesel (Black Labrador!) has found a nest in a bush and has pulled it out onto the lawn and I now have five pink chicks on the lawn and Diesel is playing with them! Can you put the nest back and try and get the chicks back in it? No! It's in a dozen bits and I think Diesel has hurt some of the chicks, and the parents have been back and have flown off. I'll be over in a couple of minutes. Keep Diesel away from them! Ok! See you in a few minutes. So there started another Rescue. 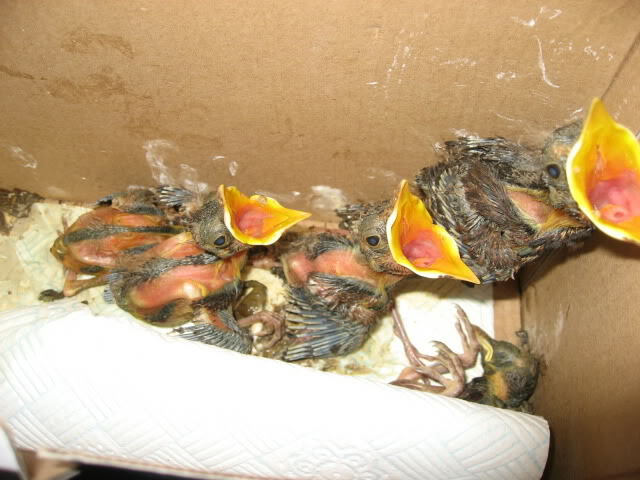 I returned home with six pink chicks, eyes closed, no feathers, no parents, no chance! The propagator from the greenhouse was brought into play. Feeding them with tweezers every twenty minutes or so became a bit of a chore, but finding worms, caterpillars, chopping them up fine and mixing them with a standard light dog food was more of a chore. You can just see One dead and one dying in the bottom of the box, but the three that remained were looking pretty healthy. They had opened their eyes and were responsive to my hand coming in the box with tweezers! Also started with feathers. I had them to work with me! I had them with me at all times! Bought some meal worms to make finding food easier. 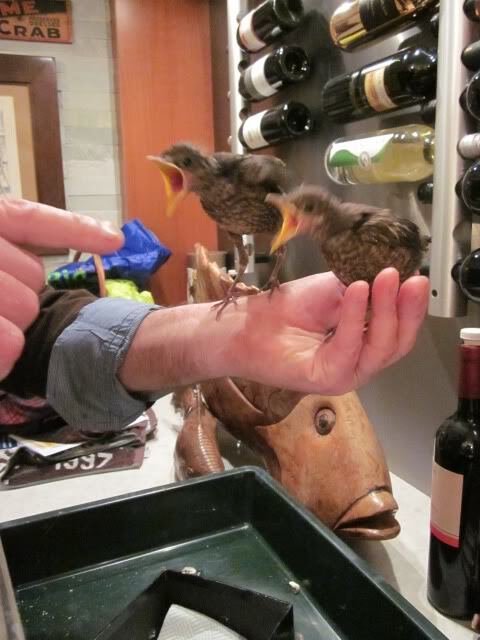 After two weeks or so, I had three healthy looking Blackbirds! Strangely, one more died one night! I ended up with just two children. I'll add the next instalment later. I have to go for a ski-ing lesson now! Shame for the ones that didn't make it - but didn't you do well to save those two! It's no easy task hand rearing baby birds as I have found out on a couple of occasions. I like the way you write about your rescues. You could write a book Shaun! Can't wait for the next installment to see what happens, so hurry up back from your skiing lesson. Hope there's no broken bones and thank you for alerting your neighbours to the dangers of slug pellets. They don't just poison hedgehogs, they kill birds too. I'm very sorry Shaun, your hog didn't make it. And to make it worse she aborted three babies just before she died. She was bleeding everywhere, so my guess is possibly rat poison or some kind of similar bait. Thank you for taking the time and trouble to bring her to me. Hate days like these. I'm going to have to go back out on the warpath tomorrow. It really annoys me that someone can be so careless with such a dangerous substance. It's the 'I'm alright Jack' attitude. Nothing else matters, that really annoys me. It was at this point that I realised I couldn't give the chicks just what they needed. I couldn't catch flies, spider, caterpillars and stuff in the same way that a parent bird could. My only hope was to try and gain the attention of another parent to look after these two. 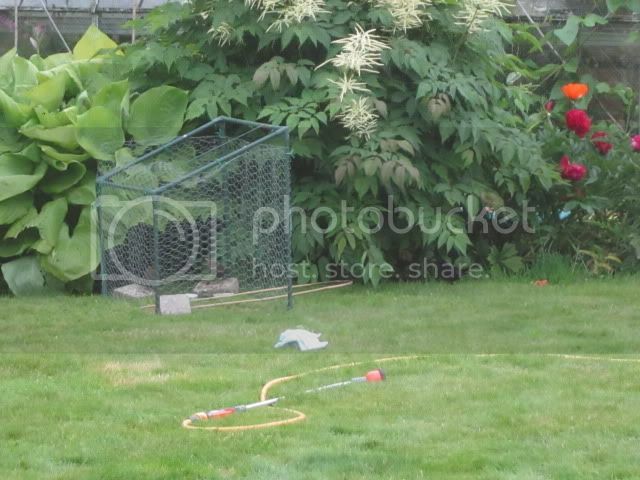 I built a mesh cage that i could put out in the garden. I have a picture somewhere but can't find it at the moment. I still had to feed these two, but they had developed a strong chirrup and I knew that this was the key to attracting a surrogate parent. After a day and a half in the garden, up against the bushes I noticed that there was a male Blackbird taking an interest, i watched it for some time and I actually thought that he was attacking the babies through the mesh. it turned out that he was feeding them! My heart missed a beat when I realised that this was happening and I felt that my job was done. I left him feeding for another couple of hours and then lifted the cage off the grass so that there was easy access for all of them. The last I saw was the two chicks following each other into the bushes, hopefully to live happily ever after! Ahh that's brilliant! I didn't even know that was possible to do with a surrogate bird. I love a happy ending. You seem to be a natural with this kind of thing Shaun. I Knew I had a pic somewhere. This is the adult bird coming to meet and feed the youngsters. Thank you for that photo Shaun. Didn't you do well raising those. I was going to message you today about another suspected hedgehog poisoning that came in this time from the Marton area. Same symptoms and definately the same overpowering chemical smell as yours. It has been taken to a local Vets for his opinion on what it might be. The person that brought it in to me told me her neighbour has poured weedkiller all along the 150 foot boundary between the two properties, and this has encroached on her side of the field killing everything for 20+ feet making her field unusable to put any animals in. It seems the police, council etc cannot do anything about it. We are hoping to tie this hog in with being poisoning by this weedkiller, and I am waiting to see what the Vet has said. When I find anything out I will let you know. It may give us a better idea of what happened to yours. That would be good Janice. It's incredible just what is going into our environment without to much regulation. I have circulated a notice to all the neighbours within 1/2 mileish just to make people aware that there is a problem possibly with rat poison, I can't see that weedkiller would make them bleed like the last one did. If it does turn out to be a weedkiller, perhaps an official complaint should be made to the powers that be! Will do Shaun and that's a good idea to circulate a notice to your neighbours. No Shaun, I haven't heard anything. They did say they would let me know. I'll chase them up and see what's what. If you would like a quarterly newsletter let me know please, send me your email address and I'll pop you on the mailing list. Hi Janice. Just to let you know that the Hedgie that you have been nurturing back to health over the past few weeks was released into the old orchard at the side of our home on Sunday evening. Hi Shaun, that's excellent that he's gone back to his home turf all fit and well. Thank you for taking him back. Anyone moved into your hog boxes yet? If not, try part filling one with dry leaves.